The electric panorama sliding/tilting roof works when the ignition has been switched on. The electric panorama sliding/tilting roof can still be operated for a few minutes after the ignition has been switched off, provided that the driver door or front passenger door are not opened. The button has 2 positions. In the first position the roof can be completely or partially tilted, opened or closed. When set to position 2, the roof automatically returns to the final position when the button is pressed briefly. Press the button again to stop the one-touch function. Tilting the panorama sliding/tilting roof. 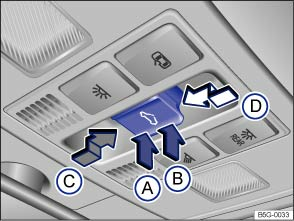 Push the rear area of the button Ⓑ to position 1. Push the button briefly to position 2 for the one-touch function. Closing the tilted panorama sliding/tilting roof. Push the front area of the button Ⓐ to position 1. Push the button briefly to position 2 for the one-touch function. Stopping the one-touch function for the tilting/closing procedure. Press the button again at position Ⓐ or Ⓑ. Opening the panorama sliding/tilting roof. Push the button Ⓒ rearwards to position 1. Push the button briefly to position 2 to open the roof to the convenience position using the one-touch function. Closing the panorama sliding/tilting roof. Push the button Ⓓ forwards to position 1. Push the button briefly to position 2 for the one-touch function. Stopping the one-touch function for the opening or closing procedure. Press the button again at Ⓒ or Ⓓ. Use the handle at the front near the roof opening to move the sliding headliner to the required position.